Maria, it is beautiful - your best horse yet! It was cooler here yesterday, and Bruno was charging around and bucking, just high on life! Thank you Kathryn! Maybe all that value talk has some merit after all, haha! Enjoy the weather, that is the down side of the cool weather, sometimes staying in the saddle can be a challenge?! What a wonderful feel this has! Do you think you will limit values again, or just be more aware of them? Thanks Mary and Pat. Pat, I think I will try this again. It really helped me not to worry too much about the color and focus on the values. I need to remember that in each of my paintings! Maria, thank you so much for your very kind words about the family portraits! 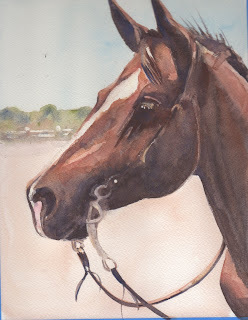 Kathryn, your watercolors are amazing, I love to see what you are working on, especially your animal and family portraits! Really nice work. Interesting idea to only use four values, too. Beautiful values and composition. I love the landscape in the background! Love the perky ears! You do such beautiful work! Thanks Carol, learning so much while painting every day, but there is so much to learn! Thank you Leslie, Im glad you noticed the landscape in the background, I kind of liked that part of the picture!